INTRODUCTION: The 1970-2 Skylarks/GSs are becoming more popular and there are a great number of cars restored as well as cars to be restored! A lot of pitfalls with cars that are candidates for restoration are discussed below. More information to be added in the future. The two biggest problem areas on the coupes is the core support/right front fenderwell area and the rear window. The front fenderwell and core support are prone to rust-out since the battery acid starts the rust process which eventually eats away the lower section of the core support and the fenderwell. There is a patch panel for the fenderwell available from Year One and costs about $80. Radiator core supports have to be patched since no repros are available now but may be in the future. Visit our new products page to see the core support repair kits. The second area on coupes that is a major problem is the rear window(see pictures below). All A-bodies, Cutlass, Chevelle, Monte Carlo, Lemans, have the same problem. Due to the design of the rear window sheet metal, the channel around the glass holds water and eventually starts rusting. Once the rust penetrates the channel, water enters the trunk and will eventually rust away the trunk floor. The only fix for this problem is to replace the rusted metal with new metal and fill the channel with clear silicone to prevent the water from sitting in the channel. A better sealer for the channel if the surface is not prepared properly is black urethane. New cars are using this sealer and it is extremely durable and can be used to replace the butyl window ribbon to seal the glass to the channel. Black urethane is available at NAPA stores as well as auto glass shops. Here is a great example of complete rear window channel rust out. This car has been sitting outside for a long time and the only thing keeping water out was the vinyl material. There was almost no metal under the top. This is the top of the window channel and this can also happen to the lower channel. This car has a vinyl top which is a great problem area and promotes rust by trapping moisture between the vinyl and metal below it. Most cars will have rust behind the rear wheel well. Use of filler(Bondo) will not solve the rust. The only way to fix this area is to splice in a new section or the entire rear quarter skin. The amount of rust around the wheel opening on this car means the best way to fix this is to replace the entire quarter skin. Skins run about $180 each and are available from several companies listed on the vendors page on this site. The rear lower panel is now available from Sherman & Associates...just check the new products page for more info. Convertibles have several problem areas. The first one is the top mechanism. If people have sat on the top when it is down they will bend it out of alignment preventing proper operation when raised. The tops also have a tendency to split above the side rear windows due to the padding moving while the top is being lowered and the mechanism pinching the top material. To prevent top pinching, make sure the pads are directly over the mechanism as it is being lowered. They have a tendency to move inward as the top is being lowered. Another problem area is the drainage of the water off the top and into the drainage trough located just behind the top's last bow. Water is supposed to run off the top and down into the drainage channel, over the rear wheel wells and exiting the car just in front of the rear tires. 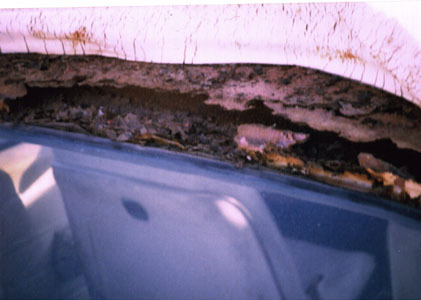 The drain holes usually get plugged and the water floods the car under the rear seat leading to floor rust and also the quarters rusting away since the water sits in the enclosed area of the quarter panel. One way to clean the drainage hole is to remove the back seat and then the side panel to access the area in front of the fenderwell. Use a shop vacuum to clean the area and remove all debris. If rust is present, the area needs to be cleaned with a wire wheel and/or brush and then undercoated to prevent future rust. The final problem is the convertible car frame itself. Since the car has no top, the frame is boxed to add structural stiffness. The coupes use a C-channel frame. The boxed-in frame has a tendency to hold mud and water leading to rust. The typical area that rusts is just in front of the rear axle. The best way to clean inside the frame is to use a pressure washer and then air dry the frame with compressed air. After the frame is thoroughly dry use an epoxy paint on the frame or undercoating. 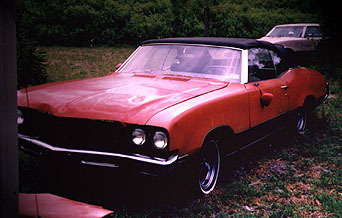 1970 was the first year for the new body style that would continue until 1973 which would see another body style change! 1970 Skylarks share the same body and chassis as the 1971-2 models with the exceptions being the bumpers and some minor interior parts. The bumpers are one- year only parts as well as the grilles and parking lights. The gas tank is also a one-year only part since in 1971 Buick went to a closed ventillation system for the gas tank and the later versions had several vent lines which ran up to the carb and charcoal purge canister located in the left front fenderwell. This 1970 GS455 has completely rotted away from the firewall back. The vinyl top was the greatest contributing factor to this car's rust out since water entered the trunk and floors. The price was right $250 for a complete non-running car but needs an entire rear clip. Car frame was spotless and the drivetrain is original. Car has white bucket seat interior with p.seat, ac, pdb, 3.08 posi, tilt, gages, rallye wheels. This is a total resto candidate and will be featured here at some future date. The 1970 interior is almost identical to 1971-2 except for four items. The first one is the pointed lenses in the instrument cluster. About Jan-Feb 1970 the lenses where changed to the flat lenses found in the 1971-2 cars. The second item is the armrest bases. On early 1970 Skylarks/GSs the bases were 16" long while the later versions were 12". The later versions are available as repros. The third item is the rear defrost located on the package tray. The grille is metal and one corner has a large radius. The defroster mounts to the grille with three studs. The later versions, 1971-2, have square plastic grilles and use four studs. The final item is the turn signal, shift lever and tilt lever found on the steering column. These items typically peel and can be interchanged with the 1971-2 versions. The 1970 version has fine ribs on the enlarged section just before the end of the lever. You can use the turn signal and tilt lever from a full size car such as an Electra/LeSabre. The GS grille is a GS-only grille and the hood scoops are the same as the ones found in 1972. The air cleaner has two square intakes(scoop openings) and is the same air cleaner as the 1971 version. 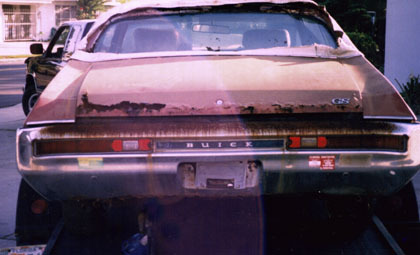 Another area of concern is the "BUICK" nameplate found between the taillight lenses(see picture 1 above). It is usually pitted/blistered since it is constructed of pot metal and there is no prevention. Repros are available for $180. The headlight buckets/bezels is another part made from pot metal. These typically blister in the lower section of the chrome area directly below the center of the headlight. To have the blisters/pits professionally filled and rechromed runs about $170-220 per side. There are no available repros parts so good ones are hard to find. You may choose to paint the bezels the same color as the body as found on the GSX models. The significant changes for this year was the closed ventillation system for the gas tank, slightly different bumpers, tail lights and different grilles for the Skylark and GS. The is the first year for the N-25 thru-bumper exhaust. 1971 GS hood grilles are one-year only. The hood grilles are made of plastic and are not available as repros. The 1971 headlight bezels have the same problem as the 1970 bezels so pay close attention to these when purchasing a 1971 car. This was the final year for the body style introduced in 1970 and there were some minor revisions to the car to make it different than 1971. The GS and Skylark use the same grilles and the GS hood grills are the same as the 1970 version. The front bumper has rubber strips added to the horizontal leading edge which are prone to ripping. Reproductions are available. The rear bumper also has rubber strips added around the tail light border. These parts are available as repros and are not cheap about $250/pr. The GS air cleaner is a one-year only piece as the driver's side intake scoop is changed to a triangle from a square. The change was made to accomodate the AIR (Air Injection Reaction) pump. 1972 was the only year for the Skylark SunCoupe which is a Skylark with a very large sunroof which measures roughly 4'x5'. There were approximately 1600 made. This was the last year for the N-25 thru-bumper exhaust. The headlight bezels for 1972 have a similar problem as the 1970-2 versions except the area around the headlight is semi-flat black/charcoal so the pits/blisters can be ground down and filled with body filler and then repainted. Here is a good candidate for a total resto. This car was purchased in 1994 for $1200. Car is complete with ac, ps, pdb, rallye wheels, 350-4bbl, TH350, tilt, fold down armrest frt seat. Car was hit in front and damage is shown in the picture above this one. Car had some water leakeage in trunk which required a new trunk floor and the rear floor pans were replaced. After pulling the body off of the frame, the frame was badly rusted in front of the rear wheels which meant another clean frame was needed. A nice solid frame was purchased for $200.